ACM SIGMETRICS sponsors three major awards to recognize important contributions in the area of performance evaluation. The SIGMETRICS Achievement Award recognizes a senior researcher who has made long-lasting influential contributions to computer/communication performance evaluation. The SIGMETRICS Rising Star Research Award recognizes a junior researcher who demonstrates outstanding potential for research in computer/communication performance evaluation. The SIGMETRICS Test of Time Award recognizes an influential SIGMETRICS paper from 10-12 years ago. ACM Fellows recognizes ACM Fellows who are SIGMETRICS members. 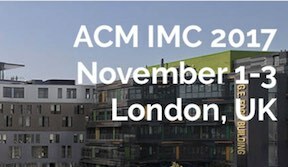 The ACM SIGMETRICS Achievement Award is given annually to an individual who has made long-lasting, influential contributions to the analysis and evaluation of computer/communication system performance. The contributions may be theoretical advances that have influenced the techniques used to predict, control and optimize the performance of computer/communication systems, practical procedures or software tools that have been used widely to manage system performance, or innovative applications of performance evaluation models that have impacted the design of computer/communication systems. The SIGMETRICS Achievement Award recipient is selected by an Awards Committee comprised of five individuals appointed by the SIGMETRICS EXECUTIVE COMMITTEE. In selecting the achievement award recipient, the Awards Committee will place particular emphasis on seminal contributions and a sustained record of high-impact in the field. The award includes a plaque and a $2000 award, as well as expenses for travel to the ACM SIGMETRICS annual conference, where the award is presented. The recipient is also invited to give a technical presentation at the conference. The nomination rules disallow self-nominations, and require that the nominator, but not the nominee, be a member of SIGMETRICS. A two-page description of just those accomplishments which qualify the nominee as a candidate for the award. Five endorsements, of at most 300 words each, from other scientists in the field supporting the nomination. At least three of the five endorsers must be SIGMETRICS members. A concise statement of the nominee's achievements to be inscribed on the award plaque. Past nominations that did not result in an award can be resubmitted. The ACM SIGMETRICS Rising Star Research Award is given annually to recognize a rising star in our community who demonstrates outstanding potential for research in the field of computer and communication performance. The selection is based on the impact of the candidate's work in the field in creating promising new ideas, paradigms, and tools related to the performance analysis of computer and communication systems, which may be analytical or empirical in nature. Depth and impact are valued over breadth of contribution for this award. The recipient of the ACM SIGMETRICS Rising Star Research award is selected by a committee consisting of five individuals appointed by the SIGMETRICS Executive Committee. The award includes a plaque and a $1000 honorarium or expenses for travel to attend the conference where the award is presented. Please submit all nominations via email by Friday April 6, 2018 to the committee chair, Devavrat Shah, at devavrat (at) mit.edu. Please use “SIGMETRICS Rising Star nomination” as the subject header. The nominator must collect all materials and send them in a single e-mail. Summary of the candidate's research accomplishments (1 page, 11pt font). Description of the significance of the candidate’s work and justification for the nomination (2 pages, 11pt font). Curriculum vitae of the nominee, including list of publications. Three endorsement letters from researchers in the field supporting the nomination. Nominator may write one of these three endorsement letters. Copies of up to three of the candidate’s most significant papers. A concise statement (one sentence) of the achievement(s) for which the award is being sought. At least one of the three endorsers must be an ACM SIGMETRICS member. The nominee must be within 7 years of having attained their PhD. The nominee can not be any of the following: nominator, member of the ACM SIGMETRICS Executive Committee, or a member of the Rising Star Research Award Committee. Nominations that do not result in an award can be resubmitted in subsequent years. Questions should be sent to the committee chair. Good luck! The ACM SIGMETRICS Test of Time Award recognizes an influential performance evaluation paper whose impact is still felt 10-12 years after its initial publication. This work revisits the problem of accurate per-flow measurement.It solves the central problems (counter space and flow-to-counter association) of per-flow measurement by "braiding" a hierarchy of counters with random graphs. Braiding results in drastic space reduction by sharing counters among flows; and using random graphs generated on-the-fly with hash functions avoids the storage of flow-to-counter association. Bairavasundaram, Lakshmi N., Garth R. Goodson, Shankar Pasupathy, and Jiri Schindler. "An analysis of latent sector errors in disk drives" In ACM SIGMETRICS Performance Evaluation Review, vol. 35, no. 1, pp. 289-300. ACM, 2007. This paper is a pioneering work about the incidence of latent sector errors i.e., errors that go undetected until the corresponding disk sectors are accessed. The study analyze factors that impact latent sector errors, observe trends, and explore their implications on the design of reliability mechanisms in storage systems. Bhuvan Urgaonkar, Giovanni Pacifici, Prashant Shenoy, Mike Spreitzer, and Asser Tantawi. "An analytical model for multi-tier internet services and its applications." In Proceedings of ACM SIGMETRICS 2005. This paper focuses on the problem of analytically modeling the behavior of such applications. It presents a model based on a network of queues, where the queues represent different tiers of the application. Andrew W. Moore and Denis Zuev. "Internet Traffic Classification Using Bayesian Analysis Techniques." In Proceedings of ACM SIGMETRICS 2005. This paper was one of the first to bring Bayesian techniques to bear on traffic classification, spawning a whole new research area that has continued to increase in activity and importance every year. Additionally, the techniques proposed in the paper were independently a valuable contribution to the field of machine learning. Stephen Blackburn, Perry Cheng, and Kathryn McKinley. "Myths and Realities: the Performance Impact of Garbage Collection." In Proceedings of ACM SIGMETRICS '04/PERFORMANCE '04. This paper explores and quantifies garbage collection behavior for three canonical algorithms which encompass the key mechanisms and policies from which essentially all garbage collectors are composed. The study is unique in its breadth of garbage collection algorithms and its depth of analysis, and its observations are still resonating a decade after its publication. Yin Zhang, Matthew Roughan, Nick Duffield, and Albert Greenberg. "Fast Accurate Computation of Large-Scale IP Traffic Matrices from Link Loads." In Proceedings of ACM SIGMETRICS 2003. The paper presented a novel, remarkably fast, and accurate method for practical and rapid inference of traffic matrices in IP networks from link load measurements, augmented by readily available network and routing configuration information. Tian Bu, N Duffield, FL Presti, and D. Towsley. "Network Tomography on General Topologies." In Proceedings of ACM SIGMETRICS 2002. This paper is a pioneering work in network tomography and it presented novel and formal approaches to perform tomography on networks under general setting, from which various performance, e.g., delay, packet lost,..etc., can be estimated. Yang-hua Chu, Sanjay Rao, and Hui Zhang. "A Case for End System Multicast." In Proceedings of ACM SIGMETRICS 2000. This paper demonstrated that multicast functionality could be provided at end systems using an overlay network, with only modest performance penalties. Lixin Gao and Jennifer Rexford. "Stable Internet Routing without Global Coordination." In Proceedings of ACM SIGMETRICS 2000. This paper provided a formal analysis of BGP routing policies, and showed how to ensure convergence to stable Internet routes without requiring routers to divulge their BGP configurations. Jeffrey P. Buzen. "Fundamental Laws of Computer System Performance." In Proceedings of ACM SIGMETRICS 1976. This paper laid the groundwork for operational analysis. Derek Eager, Ed Lazowska, and John Zahorjan. "A Comparison of Receiver-initiated and Sender-initiated Adaptive Load Sharing." In Proceedings of ACM SIGMETRICS 1985. This paper provided fundamental results for practical load balancing strategies across a large number of servers in a distributed system. Mark E. Crovella and Azer Bestavros. "Self-similarity in World Wide Web Traffic: Evidence and Possible Causes." In Proceedings of ACM SIGMETRICS 1996. This paper explained the impact of the distribution of WWW document sizes on the buildup of self-similar traffic in the Internet.